The history of Bagno Vignoni is closely linked to the hot springs on which this village has been built since ancient times. Its springs were already used by the Romans, thanks to its proximity to the Via Francigena. In the sixteenth century Piazza delle Sorgenti was built – a bath thermal springs keep flowing from today. This site has always been a renowned destination for prominent characters, including St. Catherine of Siena, Pope Pius the Second and Lorenzo the Magnificent as well as the Russian director Tarkovskji. Despite centuries of wars and ravages, Bagno Vignoni still retains its medieval splendour and charm. Over the hills dotted with olive trees around the village of Bagno Vignoni, downstream from the town, the waters used to feed into five ancient water mills carved in the rock. These have only recently been excavated and restored. Institutions and local authorities have always placed special emphasis on the management and conservation of the hot springs and the village right in the middle of Val D’Orcia. The charm of Bagno Vignoni is still irresistible today – a place where time seems to stand still. Bagni San Filippo is a small spa in southern Tuscany.Historically known for its hot springs, Bagni San Filippo is the ideal destination for an intimate and relaxing holiday. The spa has a swimming pool and wellness centre, and offers exceptional healing and all-natural beauty treatments thanks to its sulphurous waters, sediment and sludge. For nature lovers, the Fosso Bianco (White Ditch) is the perfect spot. Here a river in the woods flows at the confluence of several hot springs into a series of tanks (called “holes”) you can dive into all year round. You can also admire the special limestone formations which – thanks to their suggestive shapes – have inspired people to call it in several ways, such as “the white whale” or “glacier”. 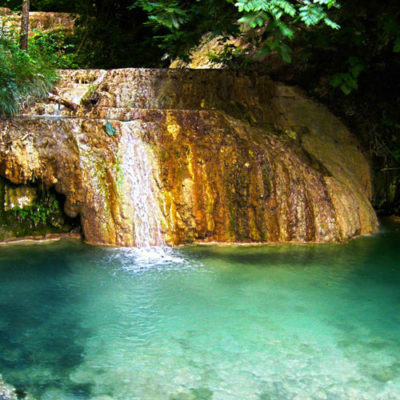 From Chianciano Terme – located inside Acqua Santa historic thermal water park in piazza Martiri Perugini – hot waters gush out. These springs are perfect to treat liver and gastrointestinal conditions. Chianciano Terme spa is open all year and ideal for spa treatments in Tuscany. Here you can pamper youself with the most advanced thermal treatments thanks to Chianciano spa staff expertise and tradition. Your wellbeing will be restored thanks to its beauty, relax and personal care treatments on offer. 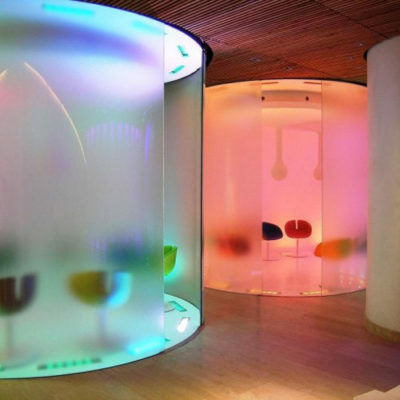 Sensory Spa: Inside Acqua Santa thermal water park, the Sensory Spa focuses on naturopathy. Here you will have the opportunity to follow different paths, through the twenty rooms that all have a specific aim – i.e. cleansing, energizing, balancing. Inside you will find the energy pyramid, the mud bath, the ice crash, swimming pools with whirlpools, a salt-water pool, two saunas, Turkish bath, the emotional showers, the Acqua Santa spring, aromatherapy, color therapy, music therapy, the Kneipp and indoors silence room. There is an indoor relax area where you can sip herbal teas, and a garden for sunbathing. You can also enter a “taste room” with a buffet menu devised by Professor Nicola Sorrentino. Upstairs the sensory Spa, the Wellness Center has been designed to combine modern technology with body health, as well as the mental and physical relaxation with classical aesthetics and techniques derived from Eastern philosophy, naturopathy and holistic approaches. Theia thermal pool: Theia stands for “She who shines from afar.” In Greek mythology, Theia was the mother of Selene, and the newest thermal pools could be named only after her. There are four outdoors and three indoors pools, all interlinked in more than 500-metres of pools, which contain Sillene thermal spring waters. This bears witness to the ancient history of the baths, already known by Etruscans and Romans. Rich in carbon dioxide, calcium carbonate, bicarbonate and sulphate – which give them a typically opaque colour – they are appreciated for their anti-inflammatory properties on the musculoskeletal system and because they are rich in nutrients for the skin. The swimming pools’ water temperature is between 33 and 36 degrees, allowing guests to dive in both indoors and outdoors in every season.